Hello and welcome to the first installment of -International Santa Claus - A Study-. I am your host, Dr. Desmond Morales. The "Santa Claus" is not just an American icon. For generations, countless cultures have developed their own versions of this mythical holiday man. It was a combination of Sinterklaas, Father Christmas and Saint Nicholas that begot the American Santa Claus. Every country has their own individual creations, some more bizarre than others. Today we are going to take a look at an interesting variation on the Santa Claus theme. The Cyclopriot. Republic of Cyprus - This island country has two versions of the same violent and monstrous Santa Claus-like being. The Cyclopriot is a tall, heavily mustached, one-eyed man in a black suit. He screams at the naughty children and smashes their toes with a hammer. The Cyclopriot is either a Greek or Turkish, depending on your own kinship. There is nothing that will keep a Greek Cypriot child in line during the holidays more than the threat of a Turkish Cypriot Toe Smasher, or vice versa. Good children get the gift of not having their toes mangled. The Cyclopriot rides a rusty, squeaky, flying bicycle. It goes on like that for 37 more verses. On Christmas eve, the children leave a hammer on a porcelain plate by the front door, in hopes that it will appease the Cyclopriot and spare them their naughty toes. The children dance with excitement the next morning when they find the hammer missing and the plate smashed. 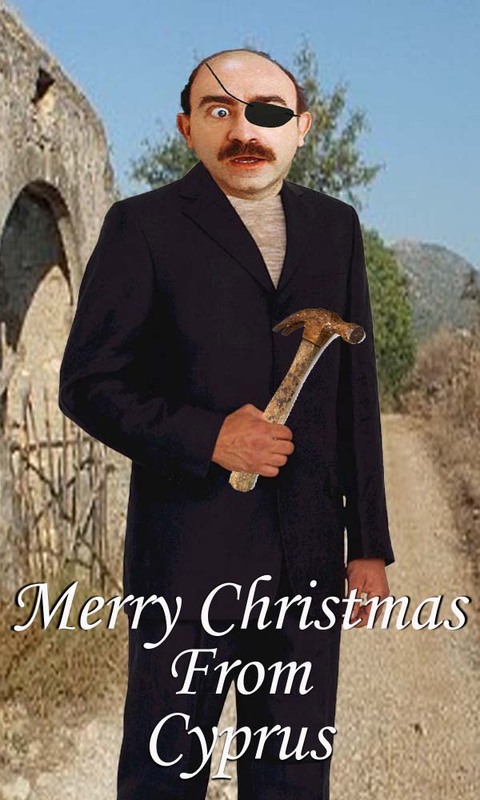 Their parents smile a knowing smile, the father happy with his annual gift a a brand new hammer. Such Holiday Fun!! The Cyclopriot spreads Christmas Cheer!